AFP Logs & Lumber Inc.
Red and White Oak, Hard and Soft Maple, Poplar, Ash, Cherry, Basswood, Hickory and Walnut. State of the art, computerized controls, assures each board is dried to perfection for high quality lumber. Our sawmill is capable of producing “industrial timber products” up to 40 feet in length. AFP Logs and Lumber, Inc. or AFP, as it is known, is a leading global provider of high quality hardwood forest products. The AFP brand name has become synonymous with world class hardwood supply and customer service. AFP was founded by Mark Caroll 30 years ago and is headquartered in Buckhannon, West Virginia. Mark was honored in 2005 as the SBA Exporter of the year. He started the company in 1987 as a log procurement and sales company and has expanded the business into one of the leading suppliers of forest products in the region, the state, the nation, as well as all over the world. AFP is strategically located in the epicenter of premier hardwood forests with close proximity to several shipping ports allowing our products to be delivered, "On Time, Every Time," to our customers all over the world. Through its lumber and log sales, standing timber, sawmills and forest management divisions, AFP delivers a full spectrum of hardwood forest products and services. AFP is committed to the stringent demands of industrial and commercial concerns, wood product manufacturers and timber owners and will exceed customer expectations by providing quality hardwood lumber and logs. AFP offers the full spectrum of Northern Appalachian Hardwood species in both lumber and logs. We supply local, domestic and export markets with lumber and logs utilized in flooring, molding and furniture manufacturing. AFP offers all native species including Hard Maple, Soft Maple, Red Oak, White Oak, Ash, Cherry, Basswood, Hickory, Sycamore, Poplar and Walnut. AFP sawmills and dry kilns supply all grades and thicknesses of the finest hardwood lumber available. AFP's industrial sawmill can saw up to 40' length timbers to accommodate the "industrial market", including the gas and oil industry, railroad tie market, bridge timber and all facets of the pallet business. AFP is equipped with the latest, most technologically advanced hardwood lumber processing and handling equipment to accommodate the most demanding customer requirements while providing a safe and desirable work atmosphere. AFP added 450,000 board feet capacity, state of the art dry kilns in 1998. In addition, we lease another 400,000 board feet of kilns allowing us to produce over one million board feet of Kiln Dried Lumber per month. With the completion of AFP's "Industrial Sawmill" in 2015, it allows for the unique ability to produce up to 40' length industrial and architectural timbers. Coupled with our High Grade Sawmill AFP produces in excess of 25 million board feet of quality hardwood lumber annually. 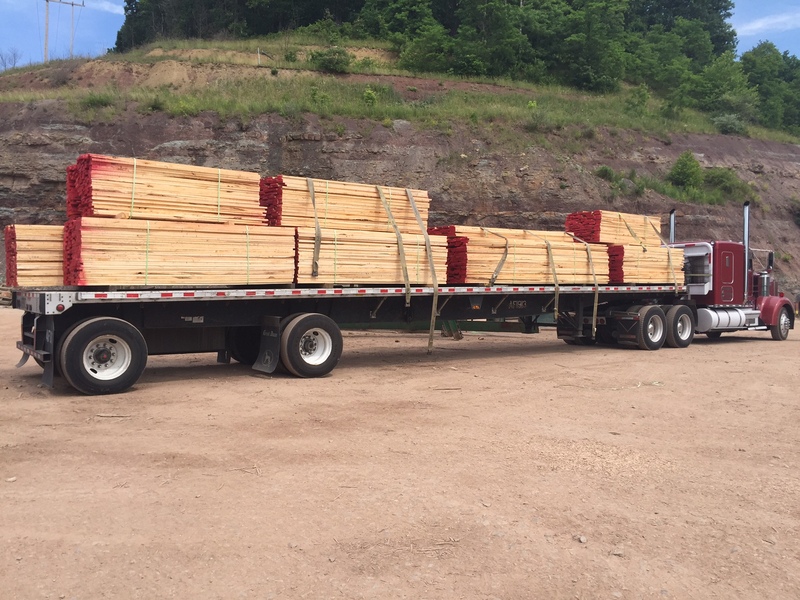 AFP utilizes Best Forest Management Practices, with respect to harvesting company owned timber and has been recognized as "Verified Sustainable" under the Appalachian Hardwood Manufacturers Industry's Verified Legal and Sustainable Program. AFP provides high quality forest products, utilizing all of this renewable resource, including sawdust for pellet fuel, hardwood chips for the paper industry, mulch for charcoal and landscaping as well as the lumber produced for all facets of everyday use in your homes and businesses. This is all accomplished with a watchful eye on the future, keeping our "renewable resource" alive and abundant. AFP Hardwood Forest Products shipped "On Time, Every Time".